This year’s Goodwood Festival of Speed will host two of the most famous Bentley models ever made: the ‘Blue Train’ Bentley of 1930 and the Team Blower race car of the same era. 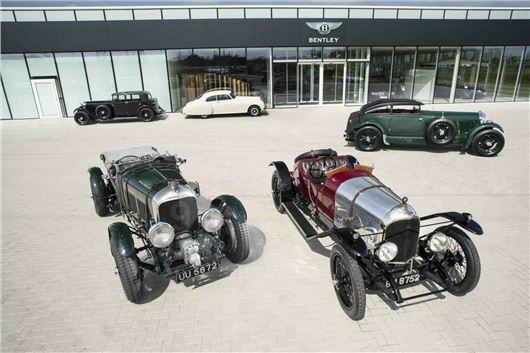 It’s part of a tour that Bentley is embarking upon to celebrate the 85th anniversaries of the Blue Train race and the Team Blower Le Mans entry. The latter didn’t win its race, but Bentley glosses over this by saying it "embodies the true spirit of the vintage racing era". The Blue Train race is probably the most famous Bentley Boy adventure of the era. In 1930, Bentley Chairman Woolf Barnato was challenged by some brass-necked roustabout to get back to his gentlemen’s club in London from his hotel suite in Cannes, before the Calais-Mediterranée Express – the Blue Train – could reach the English channel. It’s believed that he accomplished the feat in a Gurney Nutting two-door fastback (the green car on the right of the picture) - although some believe he actually did it in a Mulliner Speed 6. Nonetheless, the former car is synonymous with the journey, and it’s that which will hit Goodwood on the fourth leg of a worldwide tour. There’s no doubt about the history of the Team Blower car that’s also heading to Goodwood, however. Driven by Tim Birkin in a Le Mans race won by Woolf Barnato and Glen Kidston, the supercharged Team Blower (green car, front-left of the picture) will arrive at Goodwood fresh from a pilgrimage to Le Mans earlier in June. The Goodwood Festival of Speed opens on the 25 June 2015.